To activate one of the Clark School themes, please login to your site and go to "Dashboard"→ "Appearance" and search for these Clark themes to activate. For any questions, please send a request to: eng-webmaster@umd.edu. Custom URLs (e.g. my-project.umd.edu) are possible but require additional steps. If you have a custom URL in mind for your existing Wordpress instance, please contact eng-webmaster@umd.edu to verify the name is available and to have it mapped to your Wordpress blog. * When you request a blog site, it will be tied to your UMD account in SIMS and you will be notified to renew the site's hosting from time to time. If you are not certain if the site will be passed on to different admins, please add me (pwang24) as an account owner in SIMS so I can renew it for you (sims.umd.edu). 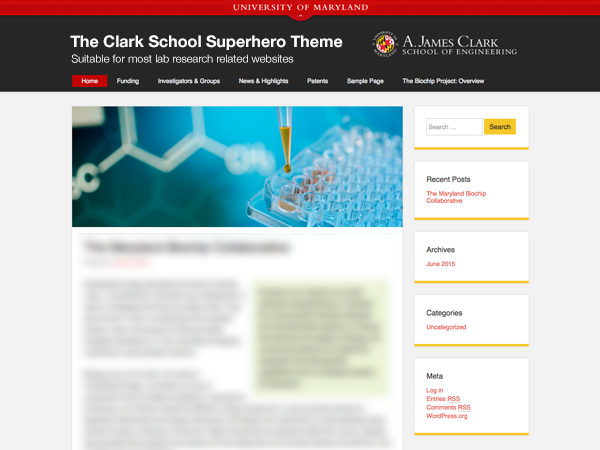 The Clark School Superhero theme is based off Superheo, a wordpress theme that gives your web pages a clean look with bright pops of color. Superhero features posts with featured images, a fixed header, and subtle CSS3 transitions. You can change your Site Title and Tagline by going to Appearance → Customize → Site Identity. Superhero has a single, primary custom menu area in the header. When a new page is added, a new link will be added into the menu. The menu can be customized (e.g.reorder, remove, and nest menu items) and set up by going to Appearance → Menus. Superhero allows you to add a featured image header onto your blog posts. The image appears above the post and can be added by clicking "Set featured image" which can be found in the bottom right corner when adding or editing a New Post. (NOTE: This is not the same as inserting an image into the blog post). Superhero features a the option to add a custom background image or color that can be customized under Appearance → Customize → Colors/Background Image. The Clark School 2011 theme is based on Twenty Eleven, a sophisticated, lightweight, and adaptable theme. Make it yours with a custom menu, header image, and background — then go further with available theme options for light or dark color scheme, custom link colors, and three layout choices. Twenty Eleven allows you to add a fixed header image on your wordpress pages. The image appears at the top of the page under the menu. You can add a new header image by going to Appearance → Customize → Header Image. We have uploaded a few Clark school default images that you can use but feel free to upload your own. The Twenty Eleven theme features three default layouts for your blog. Two of those layouts feature a typical sidebar, either on the left or right of your content. The third layout does away with the sidebar altogether. This can be customized by going to Appearance → Theme Options → Default Layout. In addition to the default layouts, the theme comes with 2 custom page templates: the Sidebar page template, and the Showcase page template. To use them, first create a page and then choose "Page Templates" that can be found in the bottom right corner under "Page Attributes. With only one click Twenty Eleven will allow you to change your blog’s color scheme from light to dark. You can find the color scheme options in Appearance → Customize → Colors. You can also find options to change your Header Text, Background, and Link Colors. Twenty Eleven has a single, primary custom menu area in the header. When a new page is added, a new link will be added into the menu. The menu can be customized (e.g.reorder, remove, and nest menu items) and set up by going to Appearance → Menus. Twenty Eleven features a the option to add a custom background image that can be customized under Appearance → Customize → Background Image.